Cooling towers and smokestack chimneys of a coal-fired power plant on the outskirts of Beijing are seen in 2010. A surge in carbon emissions from power demand in the developing world is overwhelming progress by nations including China and the United States in improving efficiency, new research shows. A surge in carbon emissions from power demand in the developing world is overwhelming progress by nations including China and the United States in improving efficiency, new research shows. Seeking to cut costs, numerous nations in recent years have scaled back or revamped the dirtiest plants that use coal, which among major forms of energy is the highest emitter of carbon blamed for the planet's rising temperatures. But a database set up by the Center for Global Development, a Washington think tank, found that the greater efficiency was far offset by emissions from electricity, which grew by 13.6 percent globally from 2004 to 2009. In the developing world, the planet's top emitter China and India both reduced the intensity of their carbon emissions by nearly 10 percent during the period. In the United States, the intensity went down by 7.3 percent. "Reducing carbon intensity by 10 percent over five years is laudable, but I wonder if we're not stuck in a trend where everyone is focused on the little efficiency gains they squeeze out here and there," said Kevin Ummel, project manager of the center's Carbon Monitoring for Action database. "At the end of the day, these just pale in comparison to the rate of consumption. In terms of climate, we're really losing the battle, even if we're making small gains here and there," he said. Overall, high-income nations reduced their carbon intensity by 5.5 percent from 2004 to 2009, outpacing their 2.7 percent growth in electricity consumption, according to the database. But in the developing world, a decline in carbon intensity of 1.3 percent was swamped by a 34 percent surge in power use. Despite the progress of prominent powers China and India, other developing economies have been heading in the opposite direction on carbon intensity, the database said. Pakistan's emissions of carbon per unit of energy jumped by 18.6 percent from 2004 to 2009. Carbon intensity went up by 18.1 percent in Turkey, 16.9 percent in Malaysia, 14.0 percent in Argentina, 10.3 percent in Iran and a giant 44.8 percent in oil-producing Kuwait. Economic growth rates in China and India have cooled from heady levels in recent years. But the impact on emissions is unclear as much of the rising carbon output comes from a growing middle class that is seeking out once-unattainable household goods such as refrigerators and air conditioners. "Frankly, I don't think anyone sees this curve significantly bending in the near future," Ummel said of the growth in carbon emissions. Carbon dioxide and other greenhouse gases absorb energy, hindering the planet's reflection of the sun's heat back into space. The planet has experienced growing storms and recorded 13 of its warmest years ever in the past decade and a half. UN-led diplomacy to draft a new climate treaty has been slow due to disputes between wealthy and developing nations. 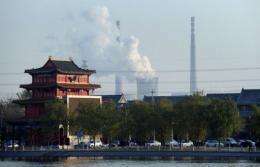 China has pledged to reduce carbon intensity, but says it is unrealistic to cut net emissions. In the United States, proposals to mandate emission cuts have failed due to political resistance. But recent data showed that US emissions nonetheless fell to a 20-year low in the first three months of 2012 as the world's largest economy uses more natural gas and as a warmer winter reduced heating needs. The database found that Canada posted the greatest reductions in carbon intensity, which fell by 22.3 percent from 2004 to 2009, followed by Spain and The Netherlands. Canada, however, withdrew last year from the Kyoto Protocol on climate change and is looking to ramp up production from Alberta's tar sands, a process of extracting energy that emits far more carbon than conventional methods.